On February 1st, 2014, Department of Public Health organized a seminar at AIUB Auditorium on “An Overview of Maternal Health in Bangladesh: Programme Implications” conducted by Dr. Wahidul Islam, MPH, Public Health Expert and Freelance Consultant. He elaborated on Maternal Health and focused on Maternal Mortality in Bangladesh, which was very high in the past but during the last decade, it has declined to meet the MDG goal. He showed some statistical data regarding programme implication on Maternal Mortality. The data implied that Maternal mortality declined to 194 per 100 000 live births in Bangladesh in the last nine years (2001-2010), which was a 40% decline. The use of facilities for deliveries increased from 9% to 23% and use of facilities for maternal complication increased from 16% to 29% between BMMS 2001 and 2010. He also showed some Trends of Maternal Health Indicators in Bangladesh based on HPNSDP. He highlighted the issue that Bangladesh is very near to meet the MDG goal (Maternal Mortality and Contraceptive Prevalence Rate) and Bangladesh needs to give more emphasis on Proportion of births attended by skilled health personnel, Adolescent birth rate, Antenatal care coverage (at least one visit), Antenatal care coverage (at least four visits) and Unmet need for family planning. At that programme Prof. Dr. Charles Carrillo Villanueva, Pro Vice-Chancellor, Prof. Dr. Tafazzal Hossain, Vice President, Academics, Prof. Dr. Ahmad Neaz, Advisor, MPH Program, Mr. Manzur H Khan, Director, Student Affairs, Public Health Faculty members, students of MPH and USAID Fellows were present. 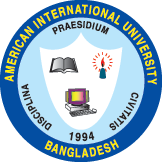 Honourable Pro Vice-Chancellor mentioned in his speech that AIUB is the first Bangladeshi university which has got its accreditation from PAASCU, a Philippine based international accreditation association. He also assured that as part of AIUB’s plan MPH programme will very soon undergo accreditation as BBA and MBA have already successfully got accreditation from the same.